What is cryptocurrency: the money of the future? Well, according to Oxford Dictionary it is a digital currency in which encryption techniques are used to regulate the generation of units of currency and verify the transfer of funds, operating independently of a central bank. This definitive guide will explain you important thing about cryptocurrencies. After reading this guide, you’ll know more about it than other people. Today, almost everyone knows about cryptocurrencies, after all, it has become a global phenomenon. 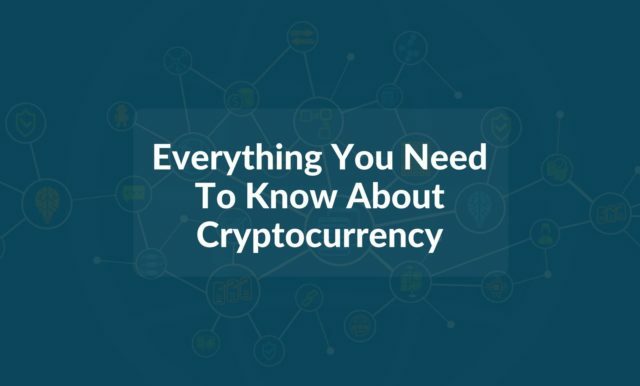 Cryptocurrencies are important, however, it isn’t understood by the majority of people including many companies, government, and banks. It is secure because It uses encryption techniques to control the generation of units of currency and to verify the transfer of funds. It doesn’t have a physical form and most importantly, it can’t be redeemed in another commodity like gold. It works on the completely decentralized network. The supply is not determined by any authority or bank. Bitcoin was the first decentralized cryptocurrency, created in 2009, Since then, numerous other cryptocurrencies have been created such as Litecoin, Namecoin, PPcoin, Etc. 1.1 Cryptocurrencies are the side product of digital cash. Satoshi Nakamoto, the inventor of Bitcoin, never intended to invent a currency. His goal was to create a digital cash which many people failed to create before. Announcing the first release of Bitcoin, a new electronic cash system that uses a peer-to-peer network to prevent double-spending. It’s completely decentralized with no server or central authority. – Satoshi Nakamoto, announcing Bitcoin on SourceForge, on 09 January 2009. Just like a Peer-to-Peer network for file sharing, Satoshi tried to build a digital cash system without any central entity. And that’s how it became the birth of cryptocurrency. Let’s have a look at the following example given by James Altucher in his book Crypto-currencies 101: How to Make a Fortune From Digital Currencies. James wants to send money to Joe. 1 – James tells his local bank. They tell the local reserve bank. 2 – They tell the Federal Reserve (who quietly tells the IRS). 3 – The Federal Reserve tells the central bank of Joe’s country, who then tells Joe’s local bank. 4 – And finally Joe goes to his ATM and takes out the money. There is the possibility of human error in each and every step. There is also a transaction cost in each step, built-in inflation of a centralized banking system. Here everything runs using the blockchains all over the globe. Anyone who has the copy of blockchain can perform a validation of transaction in the full chain. In crypto, we don’t need a central bank to validate the transaction. Blockchain allows us to have a copy on the network which automatically validated all transactions. So, the main purpose behind crypto-currencies was to create a secure and anonymous way to transfer currency from one person to another. Here we have an infographic from blockgeeks.com. Let’s understand how it works. When someone requests a transaction it broadcast to P2P Network consist of computers, known as nodes. The network of nodes validates the transaction and status of the user using algorithms. A verified transaction can involve cryptocurrency, contracts, or any other information. After verification, transaction got combined with the other transaction to create a new block of data. The transaction gets known by the whole network immediately, however, it takes some specific time to get confirmed. Once the transaction is confirmed it can’t be reversed, after all, it is a part of blockchain and here all record of historical transactions are immutable. 2. 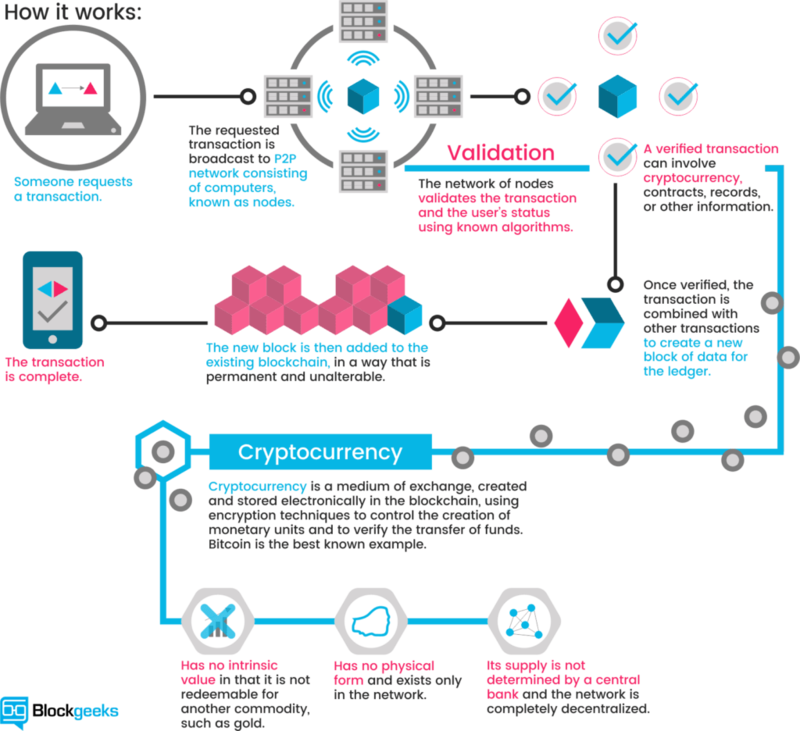 What is a blockchain? The blockchain is the continuously growing list of blocks. Each block contains a cryptographic hash of the previous block, a timestamp and transaction data. The blockchain’s database isn’t stored in any single location. The blockchain is secure because there isn’t any centralized system to corrupt. Let’s understand this with the Google Docs analogy from the blockchain specialist, William Mougayar. “The traditional way of sharing documents with collaboration is to send a Microsoft Word document to another recipient and ask them to make revisions to it. The problem with that scenario is that you need to wait until receiving a return copy before you can see or make other changes because you are locked out of editing it until the other person is done with it. That’s how databases work today. Two owners can’t be messing with the same record at once.That’s how banks maintain money balances and transfers; they briefly lock access (or decrease the balance) while they make a transfer, then update the other side, then re-open access (or update again).With Google Docs (or Google Sheets), both parties have access to the same document at the same time, and the single version of that document is always visible to both of them. It is like a shared ledger, but it is a shared document. The distributed part comes into play when sharing involves a number of people. 2.1 How blockchains can solve the problem? Cryptocurrencies are the side product of digital cash, before blockchains, everything was run through the central servers. Each transaction relied on several points. There were possibilities of failure on each and every point before it reaches the destination. The most important part of blockchains is, it works on a decentralized network that means it can’t be controlled by any single person. The blockchain eliminates all risks that come in the centralized network. 3. What is cryptocurrency mining? Cryptocurrency is an application of blockchain. As we seen in the previous section, blockchain is nothing but a number of records in a block. This block becomes a stack in the form of a chain and that’s the reason why it’s called as a blockchain. In Cryptocurrency Network, the job of miners is to confirm the transactions. Let’s take a look at the example. For example, suppose Person A sends 10 BTC to Person B, where this transaction happened in Block A which has the information about 10 BTC. This transaction can’t be complete without confirmation. Here, confirmation is done by the miners, they need to approve the transaction by performing computational mathematics. Miners got rewarded with a part of the mined coins. Miners need a computer with a special program which helps them to solve the complicated maths problem. Remember, anyone can be a miner since it is a decentralized network. Well, let’s start with the Pros! Unbiased confirmation policy helped by software. No governments, borders, middlemen and extra transaction costs. Distributed power with nodes running all over the world. Miners approve transactions one block at a time. As it’s a block with a set of transactions, if transactions don’t get validated with one block, it has to wait up to a certain amount of time to get into a next block. 5. Why Do Other Cryptocurrencies Exist? Bitcoin was created for the removal of any third parties in the regards of transactions. Bitcoin is open source, that means anyone can see the code. Right now, there are 1100+ cryptocurrencies. It’s a data-based currency, called filecoin which creates peer-to-peer storage. Only “miners” of the Bitcoins can confirm transactions, and important thing is, everyone can be a miner. Miners verify the block and get rewarded with digital tokens. cryptocurrency is not bound by exchange rates, transaction charges, interest rates. The future of cryptocurrency means allowing you to have the great control over your own money. Sodaka Digital FinTech blockchain development services includes end to end delivery of secure decentralized solutions for various integration of blockchain-based modules into existing software to ensure data integrity and compliance, and secure against fraud. Sodaka Digital builds cryptocurrencies on top of existing platforms like BitCoins , Ethereum, and develop decentralized cryptocurrency platforms from scratch equipping them with wallets for secure transfers, payments and exchanges. Sodaka Digital FinTech team offer Blockchain consulting and technology support to launch ICO campaigns, including token design, cryptocurrency wallet development, smart contract implementation, landing page and admin part creation, and infrastructure maintenance. We implements Blockchain architecture across domains to secure transactions, control data, track digital assets, record events and prevent fraud. Sodaka Digital FInTech implements smart contracts across all Blockchains to enabled transparency deals and agreements. Sodaka Digital Fintech team also creates smart contracts to support any kind ICO crowd-funding or automate business operations and commercial transactions using Ethereum or other platforms. Next articleWhat is a cloud communication?